The "Voice" coach shared a touching on-stage moment with his girlfriend after winning big at the People's Choice Awards. It was a night of wins for Blake Shelton at the E! People's Choice Awards Sunday, but those honors were only part of the excitement. The country music crooner took the stage to celebrate both his Country Artist of 2018 win and the Competition Show award for "The Voice" — and when it came to the latter, he found something else to celebrate as he looked out into the audience. Of course, he's not the only one who loves her. Stefani's long-time friend and "Voice" host, Carson Daly, immediately invited her to join them on the stage. “You wanna come up? Come on up!" he said before chanting, "Gwen! Gwen! Gwen!" As Stefani, a three-time coach and two-time advisor on the series, stepped up to the stage, Daly then gestured to Shelton and added, "Who would’ve thought that this country artist could land one of my oldest friends in the music business?" That playful jab earned a laugh from the "I Lived It" singer, but Stefani stepped up to the mic and got sincere about it. "Oh my, God! I’m so excited to be with Blake Shelton," she said. The mutual raves were fitting for an awards-show moment honoring "The Voice," since that's where the pair found love. 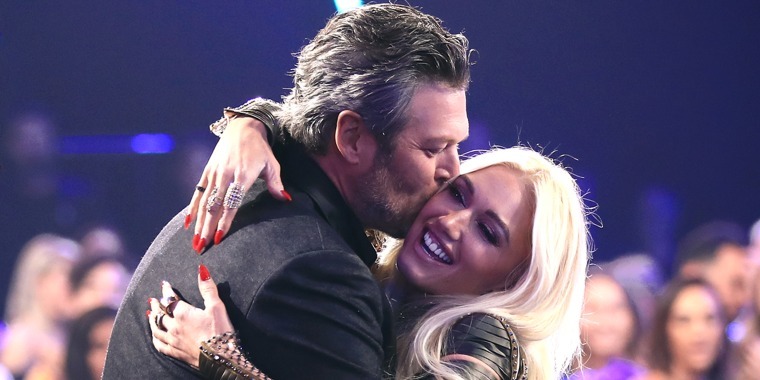 Shelton, 42, and Stefani, 49, fell for each other while working together on the talent competition, shortly after each of them split from their previous partners in 2015. As for Sunday night's onstage love fest, it ended with Daly declaring, "They're going to get a room."